A rare break in the morning clouds above the Bow Hut afforded the rare view we sought. Canadians call it clag. 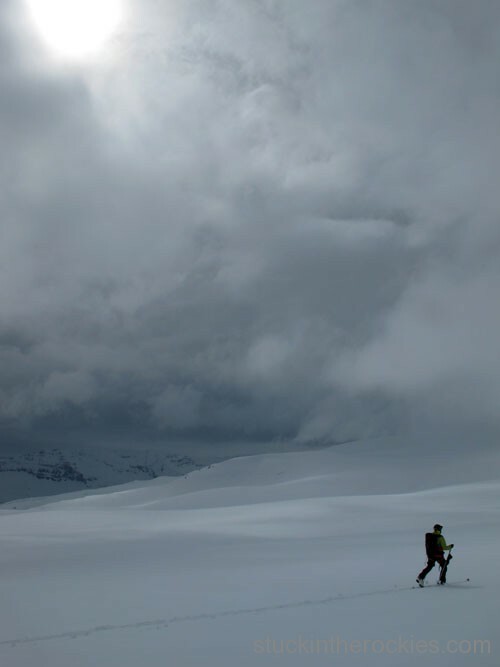 Fortunately for Coloradans, a high treeline and lack of glaciers prevent whiteout conditions from being an issue much of the time. 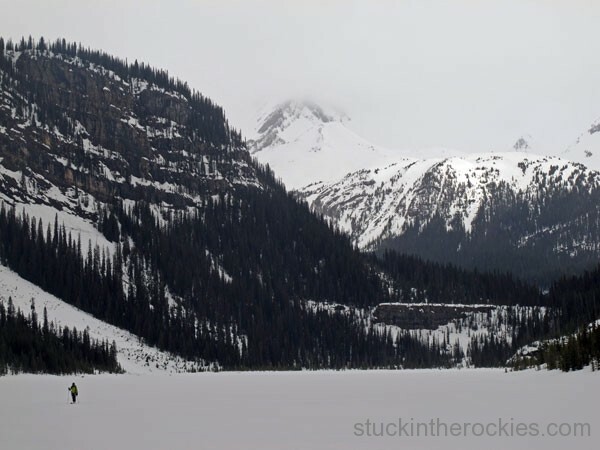 But on a recent trip to the Icefields in the Canadian Rockies, we got a good taste of what claggy weather is all about. 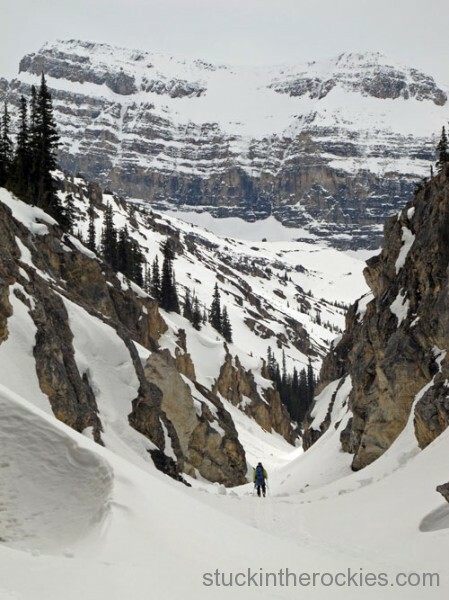 For the first part of our Canadian spring ski trip, Sean and I completed what’s known as the Wapta Traverse. 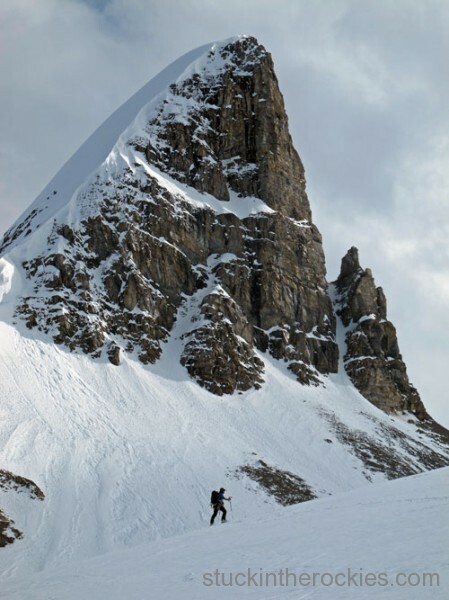 There are a couple of different ways to do this sort of Canadian “Haute Route.” Variations exist for both the start and finish, you can stay at as many as five different huts in the area, and there are a bunch of side trips and peak climbs to keep you busy as you go. 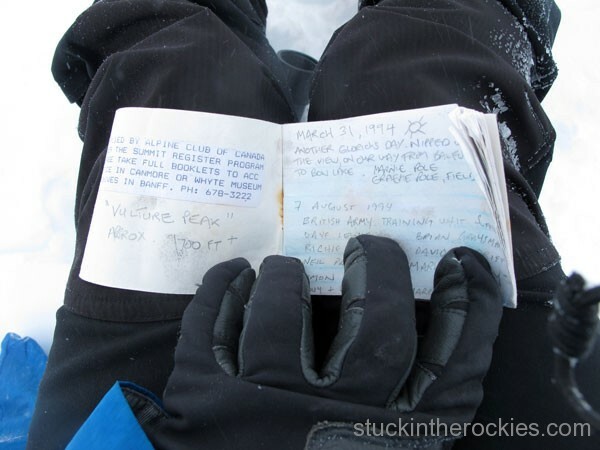 A scan from the Chic Scott guidebook shows the gist of it all. Click to enlarge. 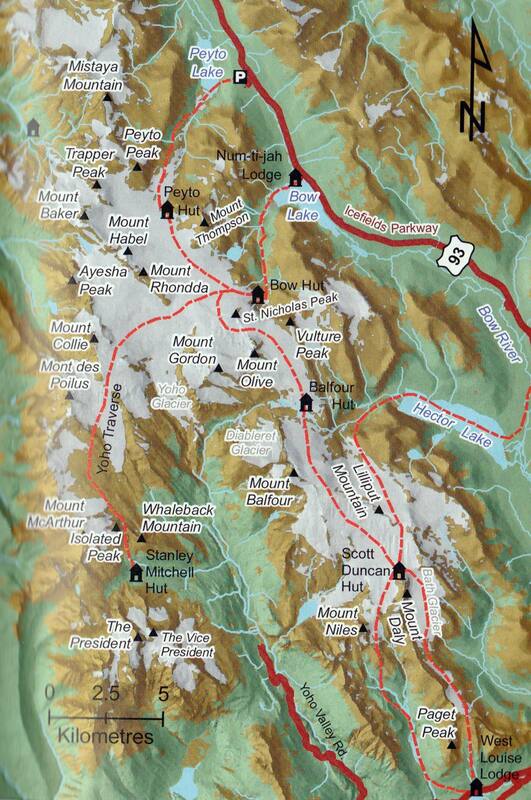 The route we completed began at Bow Lake on the Icefields Parkway and took us to the Bow, Balfour, and Scott Duncan huts. 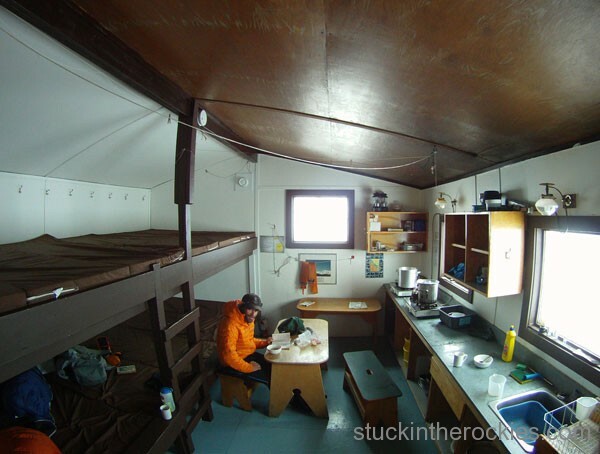 We stayed at the last one for two nights and eventually finished at the West Louise Lodge via Sherbrooke Lake. When it was all over, we traveled 26 miles in five days. If that sounds like a light amount of ground to cover over that much time, it is. But this was, after all, a vacation for us. 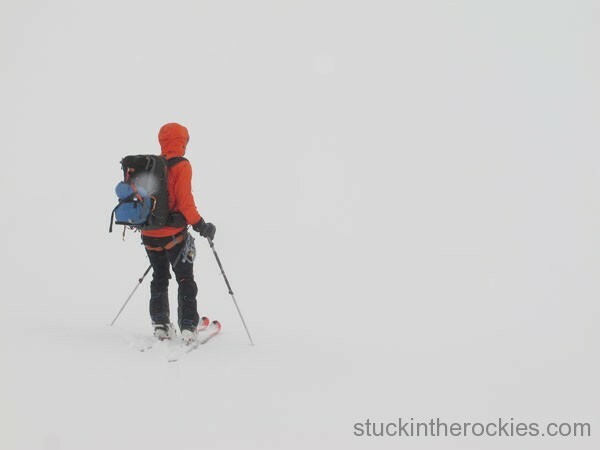 So it was five days out on the Wapta, with many of them in full-clag conditions. 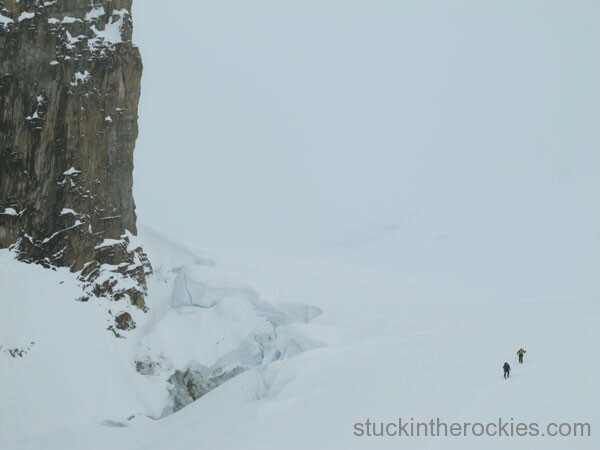 The visibility was so poor at times that we were forced to navigate by GPS and map, unable to tell if we were above crevasses or even moving at all. Despite the conditions, which also weren’t too conducive to exciting skiing or scenic views, we did manage to have a really good time, and even got a few photos along the way. Sean, en route to the Bow Hut from the start at Bow Lake. With room for about 24 people, the Bow Hut was the largest of the huts we visited, and had a kitchen area separated from the bunks. A quick tour the afternoon we arrived provided the nicest weather we saw all trip. 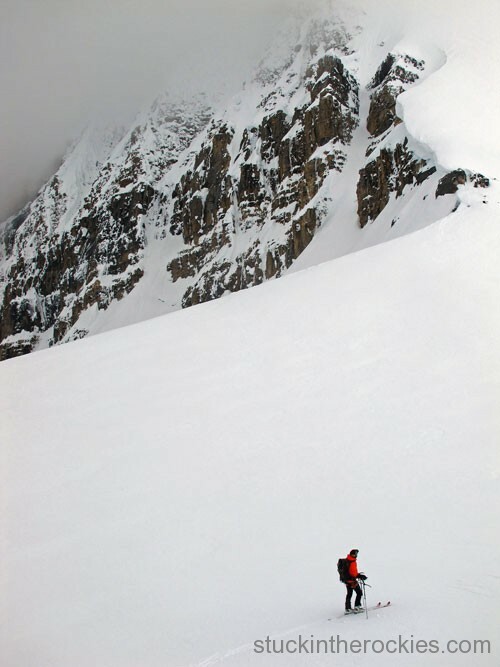 Here, Sean skins up below the dramatic West Face of St. Nicolas Peak. The next morning (day 2), the route went up from the Bow Hut (behind) to the the St. Nicolas/Mt. Olive Col, and down to the Balfour Hut. Sean on his way to the Col. The distance to Balfour Hut is short, so while the clouds were broken, we made a side trip to the summit of Vulture Peak. 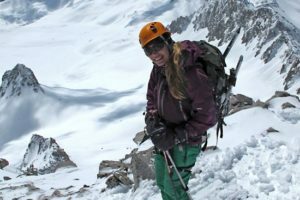 It’s not too lofty a summit, but a worthy side-trip, and a seemingly seldom visited peak, at least according the the still unfilled register dating back to the mid-nineties. 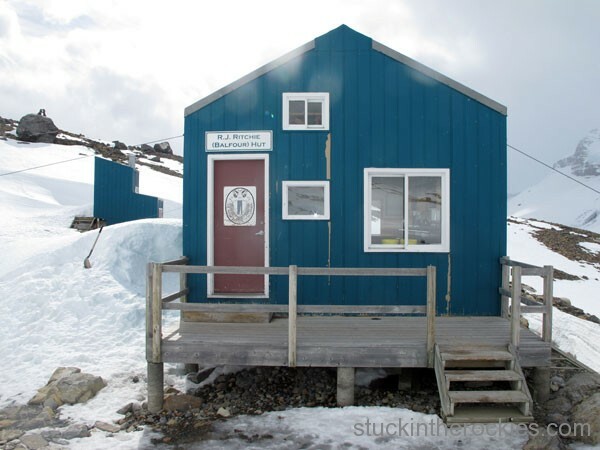 The Balfour Hut, my favorite of the three we visited. 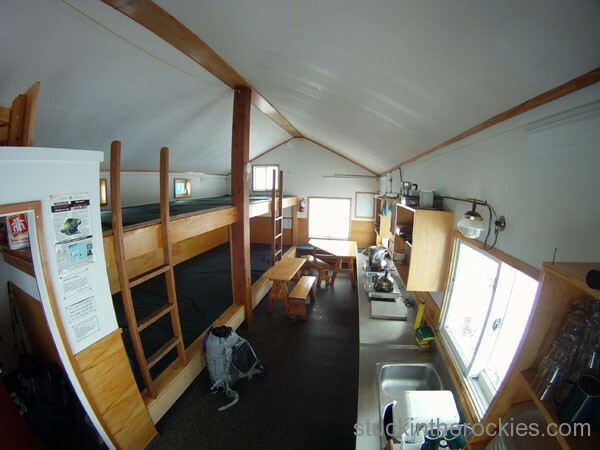 We were told the Peyto Hut, which involves a different start than Bow Lake, is also really nice. It’s pretty roomy for two, but fourteen people would eventually pack in here for the night, and things got a bit tighter. 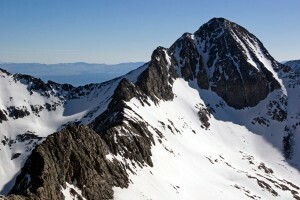 The next morning (day 3), we made our way over the Mount Balfour High Col, the crux of the route. 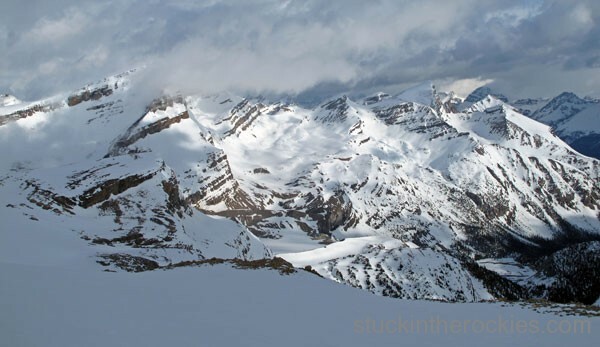 The broken glacier can present some route finding challenges, but the record snow year in Canada filled many of them in with snow. Two new friends from another group at Balfour Hut can been seen here skinning into the clag on their way up. This is known as being inside the ping-pong ball. Here’s Sean, somewhere near the Balfour High Col, with possible crevasses lurking, unsure of which way is what. 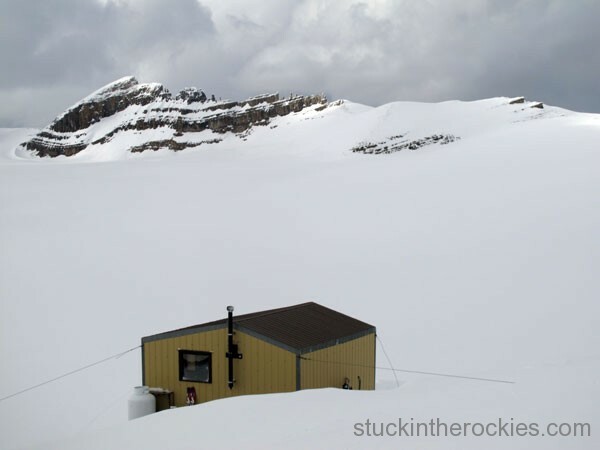 Eventually we skied through the clag and made it to the Scott Duncan Hut. 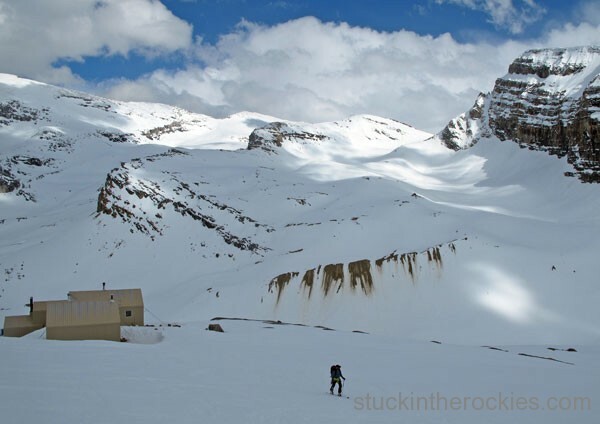 It’s a more modest abode and though it can’t be seen here, it sits on a rocky perch a few hundred feet above the glacier. When the clouds broke it had the best views. It’s listed as sleeping twelve and may not be as polished as some 10th Mountain Huts but is welcome escape from the wind and snow we were in all morning. And when it fills up a bit more (seven people in this case), it starts to get a bit tight. 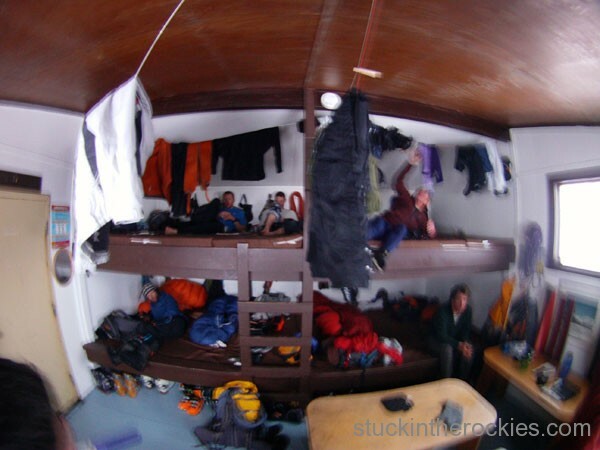 On Day 4 we slept in and eventually decided to head out on a small ski tour despite the unsettled weather. It was in and out like this the whole week. 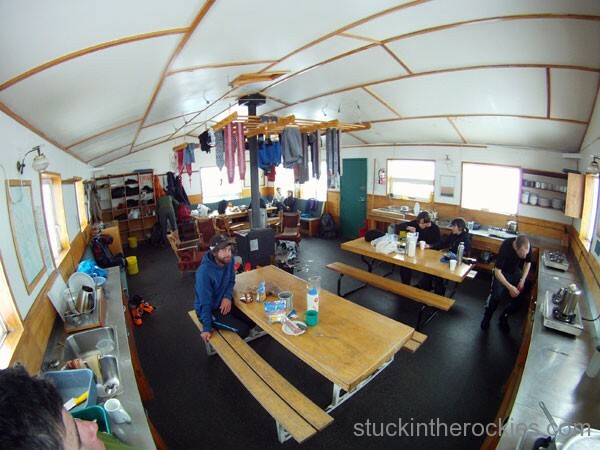 On the 5th day, after a second night at the Duncan Hut we skied down to Sherbrooke Lake and our car at the West Louise Lodge. It was a fun trip, but we didn’t have much time to dwell on it. We had to boogie to Calgary to pick up Christy and Joey because we were all flying into Fairy Meadow Hut the next morning. I’d recommend this trip highly. 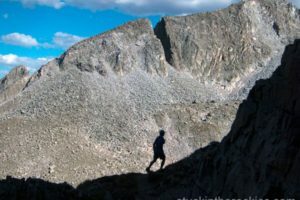 The vertical isn’t massive, nor is the mileage, but with a heavy pack and some weather, you’ll definitely feel like you’re putting in some effort. It’s a whole lot easier to get to and considerably cheaper than its European equivalents, i.e. the Haute Route, Ortler, or Berner Oberland. 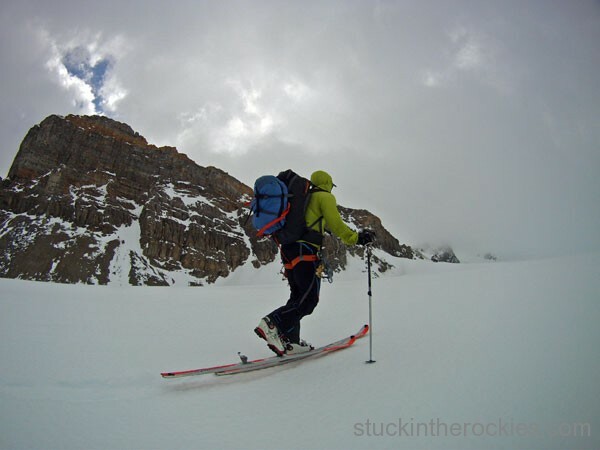 And if you’re dealing with limited time, it would be reasonable to pull off in as quick as a four-day weekend, in fact the new generation of skimo racers do the whole Peyto Lake to finish in about 8 hours total. Give ‘er. Thanks for the report. Looks like the Lake District in July only minus the snow. And glaciers. A good example for sure. Thanks again for “The Shining Mountain.” I plowed through it with all the down time we had. It was really well done, it made me feel like I was there with them. And it also made me realize how lousy many of the books covering mountain climbing are these days. Oh well. Perhaps you know this, but they both died on Everest in 1982. Great that you got to meet him. Great pics man on what sounds like a wonderful trip albeit the “clag”. Just makes you appreciat the bluebird sunny days back here, right? Congrats on a sweet traverse man. Hope all is well with you & Christy. Cool trip guys. Excited to see the Fairy Meadows photos. Have a great time on Mt. Hood and in the PNW. Safe travels, eh? Billy, that shot sums it up for sure. It definitely made me appreciate the 300 sunny day average we have here in CO. Speaking of which, the 10-day in Hood River, OR is all sun right now too. We’re psyched to join Dav up there this Saturday. Doyle, Fairy Meadow pics are coming ASAP.